I've tried to compile a range of different Gothic wedding cake ideas with photos of Gothic wedding cakes, along with ideas for a Gothic wedding cake topper and much more. If you're planning on having a gorgeously Gothic wedding day then let me help you put the icing on the cake so to speak with an outrageously fantastic wedding cake. 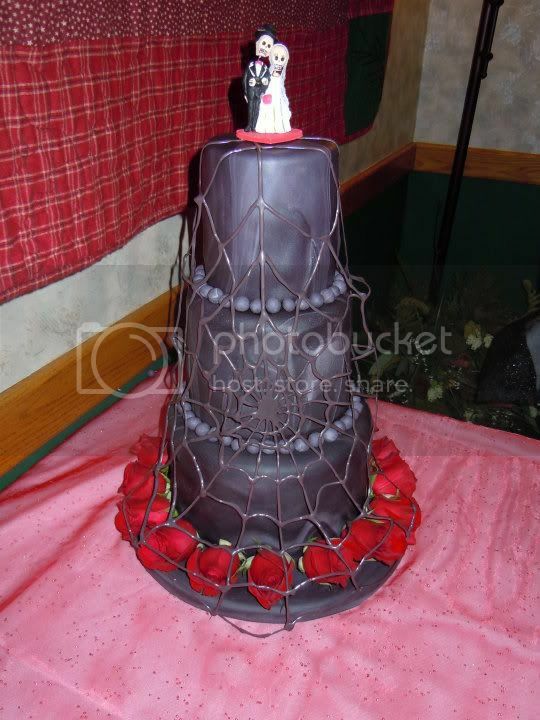 What is a Gothic Wedding Cake? Some people think that a Gothic wedding cake means black and full of doom and gloom, but there's just so many different takes on the word 'gothic' that it can mean a range of different types of wedding cake even a classic white cake. 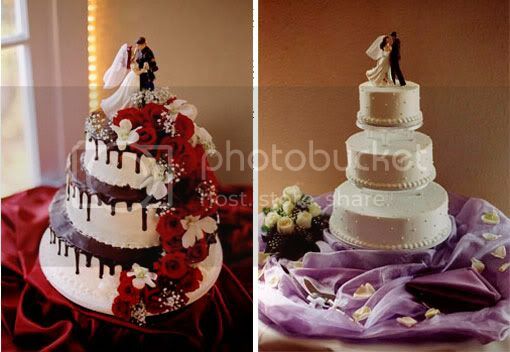 The cake on the right looks like a classic tiered white wedding cake, however on the left the same cake shows how easy it is to transform a more 'traditional' wedding cake into a Gothic style wedding cake. All that was done was that melted chocolate was put on top of each layers and allowed to drip down the side of the cake - the tiers were placed on top of each other and red roses (along with other flowers) were placed on the top along with the bride and groom topper and allowed to gently cascade down the cake. Many Gothic weddings are based around the romance of a red rose whereas others use a black rose for decoration as the romantic Goths are all about eternal love, even after death. 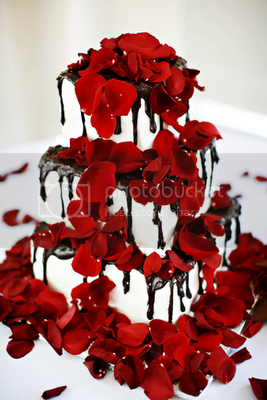 This cake is a white wedding cake that uses red rose petals and dripping chocolate to give it a really Gothic 'flavor'. 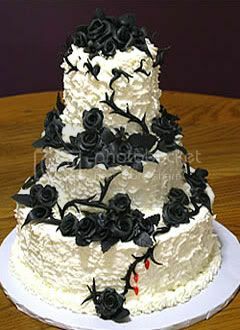 Another way of incorporating red roses on a Gothic wedding cake is to take a black iced wedding cake and decorate it with red roses. 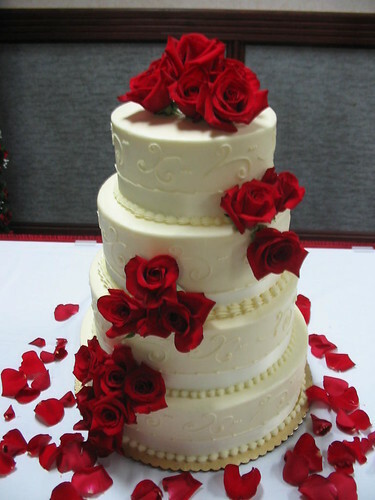 You can either have a tiered cake (using tiered stands) and have red roses between each tier or you can have a plain black cake with some cascading red roses as decoration. Black roses are also seen a lot in Gothic wedding cakes and this next image is a prime example of this. 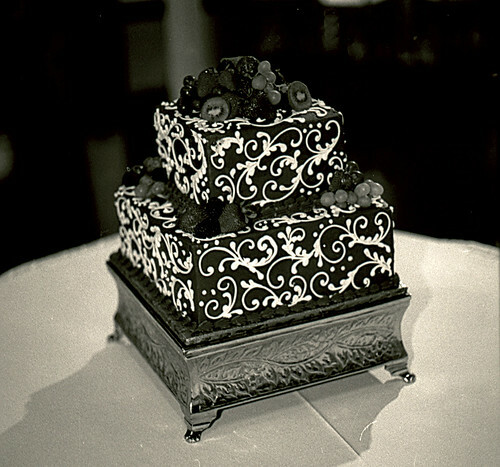 Black and white cakes look great at a Gothic wedding especially damask designs which really embrace the so called 'traditional' or 'romantic' sub-culture of Goth. 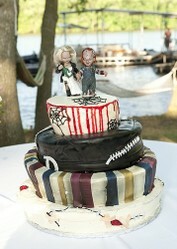 The cake below is actually a Grooms cake, but is a great example of what you could use as a Gothic wedding cake. Simply decorate it with fruit as on this one or add some red roses on top of the cake to bring a little more drama to the cake. 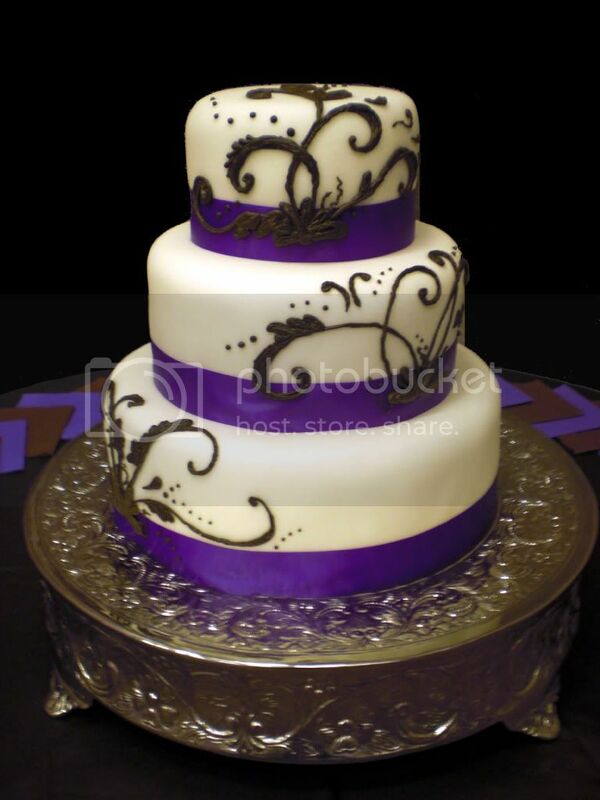 Purple is another color that's attributed to Gothic designs regularly as well and this cake here features both the color purple and the black and white damask pattern that we spoke about above. I love the look of this wedding cake and it could very easily be incorporated into a Gothic wedding. You could even add a few flowers on top of the cake (black roses for example) or you could find some gorgeous Gothic wedding cake toppers to pop on there instead. Alternatively leave it as it will also work really well. The beauty of this design is that it doesn't scream Gothic so if you love some Gothic designs, but you're not a committed Goth then this cake could appeal to you. The next cake we're going to look at is another shade of purple (more of a merlot shade) and is most definitely Gothic in design. 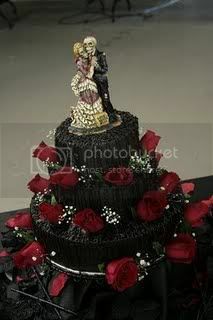 It incorporates black and jewel red on the cake as well as elements such as spider webs, black roses, filigree work and more. 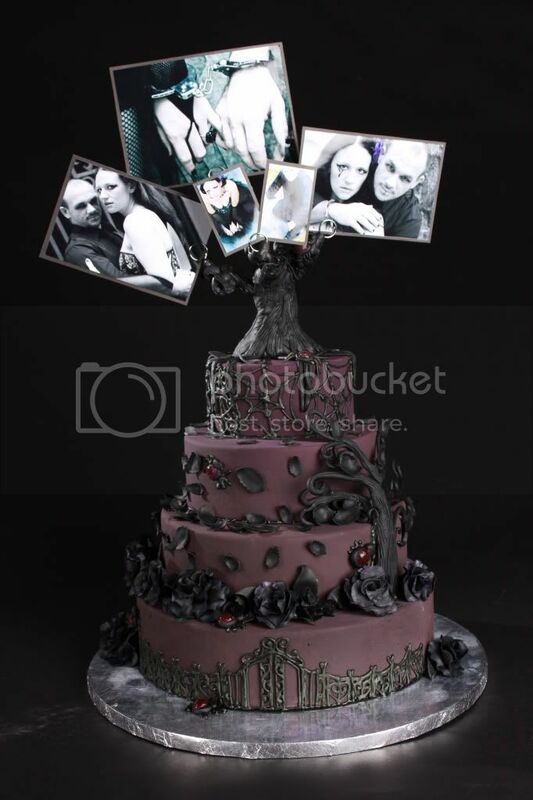 As a cake topper they've gone with what looks like a scary, haunted tree photo holder and have added pictures of the bride and groom to add a personal, yet Gothic finish to an absolutely stunning wedding cake. You can choose a Gothic themed wedding cake like the ones above or a more classical one, but pull together a Gothic theme depending on your choice of wedding cake toppers. I've found a selection of both wedding cake toppers and figurines that you can use as wedding cake toppers based on skeletons which I think would look awesome atop a Gothic Wedding Cake. As I've discussed before red roses are a very Gothic symbol as well as being associated with more traditional weddings. Now if you take off two or three of the red roses from the top of the cake and add one of the Gothic skeleton wedding cake toppers I've featured above you have managed to change a traditional, classic wedding cake into a gorgeous Gothic inspired wedding cake. Remember Gothic does not have to be black or dark purple and gloomy - it's more about attitude and the wedding cake toppers above certainly have plenty of attitude. There are lots of different types of Goth as well and some sub-cultures embrace brighter colors as well which is where some of the wedding cake toppers I've found below come in very handy. There are some awesome Day of the Dead Skull Wedding Cake Toppers on the market and the great thing about these is that they're available in a range of different colors which means whatever wedding color scheme you choose you can find a skull wedding cake topper to suit. I've included some of the more traditional 'Gothic' wedding color schemes first with black, white, red and purple sugar skull wedding cake toppers for you to choose from. Cyber Goths seem to prefer bright pink, electric blue and neon green colors added to black for their wardrobe which is why I've found some brighter sugar skull designs on these Day of the Dead Wedding Cake Toppers. Using one of these colors can open up your Gothic wedding to a much brighter occasion while still staying true to your Gothic roots. I must admit I'm not a Cyber Goth myself, but I have seen a very cool bright pink and black wedding cake which was screaming out for one of these wedding cake toppers. Unfortunately I don't have access to a photo, but it was three layers, one and three simply had bright pink fondant covering them with some black icing in a damask pattern on the bottom layer and a different pattern on the top layer - almost like filigree work. The middle layer used black fondant which had been scored in a criss cross pattern and on the x parts were silver cabochons giving it a leather rock feel. If you added one of these pink skull wedding cake toppers it would have been a perfect Cyber Goth wedding cake. Gorgeously Dark Gothic Wedding Cakes That Is! Those are beautiful cakes. I love the colors red and black together. I still don't understand what Gothic really is. I find it confusing.